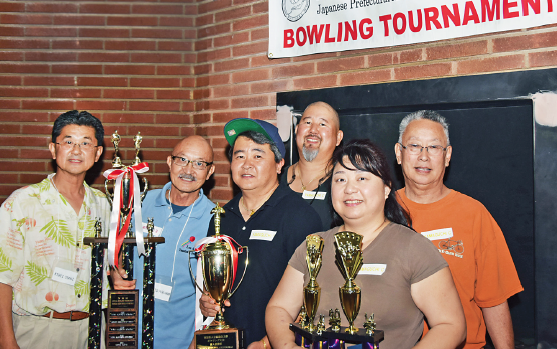 TORRANCE — Nanka Kenjinkai Kyogikai held its eighth annual Bowling Tourna­ment on Nov. 9. Twenty-four teams with 96 non-bowlers and competitive bowlers enjoyed the fun event that filled the lanes at AMF Bowl-O-Dome in Torrance. Yamaguchi Team C won the team division with a total of 2,084 pins, besting Kansai Team A by only 16 pins. Kumamoto Team A captured third place with Shiga Team B gar­nering fourth and Yamaguchi Team A taking fifth. The high game scorer in the Male Division was Kumamoto’s Steven Nakauchi with 233, followed by Yamaguchi’s Kevin Pei with 225, and Shiga’s Glen Matsuda with 204. The high game in the Female Di­vision was won by Yamaguchi’s Pei Eto with a score of 200, Kagoshima’s Miki Watanabe scored 184, and Kagoshima’s Noriko Fukunaga scored 165. In the Individual Males Series with a score of 580, Kevin Eto of Yamaguchi Team C took home the trophy followed by Brian Giegoldt (563) of Kansai A Team and Gie­goldt’s teammate Sabro Takeda (544). Kumamoto Team A’s Tak Ari­za scored 519 and Kagoshima Team C’s Ayumu Ohmae scored 301. Pei Eto of Yamaguchi Team C was high scorer with 557, Okinawa Team A’s Miyuki Oyakawa scored 489, Kagoshima Team D’s Miki Watanabe scored 487, Kansai Team B’s Hisako Kokubo scored 433, and Miyazaki Team B’s Miyako Kadogawa scored 213.